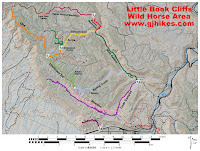 The Upper Round Mountain trail is located in the Little Book Cliffs Wild Horse Area near Grand Junction, Colorado. The trail follows a road beginning at Low Gap Camp where it extends along a ridge for 4.2 miles to a gas well and comes to an end. From the gas well the Round Mountain hiking and horse trail begins that descends from there down into Main Canyon. It is not uncommon to see various herds of wild horses while traveling the length of the road. To get to Low Gap Camp where the trail begins start in the town of DeBeque at the intersection of 4th and Minter. Follow the signs for Winter Flats and the Wild Horse Area heading south on Minter Avenue. The route turns west on 2nd Street, south on 44 Road and west again on V 2/10, aka Deer Park, aka Winter Flats Road. Continue following the gravel and dirt road for about 19 miles and turn left toward the Wild Horse Area Indian Park Entrance. After about 5 more miles the road reaches Indian Park. When you get to the sign in this photo turn left towards Round Mountain rather than going all the way to Monument Rocks. During good conditions the entire road can be navigated with a normal to medium clearance vehicle. After turning left at the Indian Park sign it is about 2 miles to the Low Gap Camp where there is a restroom, picnic tables, horse corrals and a few campsites. The entire length of the Upper Round Mountain trail follows a good road. Any vehicles that made it this far from DeBeque will have little trouble with it. On this trip we came across 3 separate herds of wild horses. The first herd of 8-10 horses was within a half mile of Low Gap. A little past that point there was another herd off in the distance to the north that was almost out of the cameras range. There are some minor hills that don't amount to much in dry weather. From the top of Round Mountain there is a nice view down Main Canyon where through the mouth you can see the Town of Palisade's water tanks that sit along the Rapid Creek road at the base of the Grand Mesa. The big attraction on this day was the wild horses. Some folks call them mustangs and others call them broom trails. Years ago we used to drive cows out here from DeBeque for spring pasture and then push them up Car Creek to the Roan Plateau for summer range. We knew a couple of old timers that used to change out the studs every once in awhile to create some variety and keep the herds from getting inbred. That sort of thing is really frowned upon nowadays. 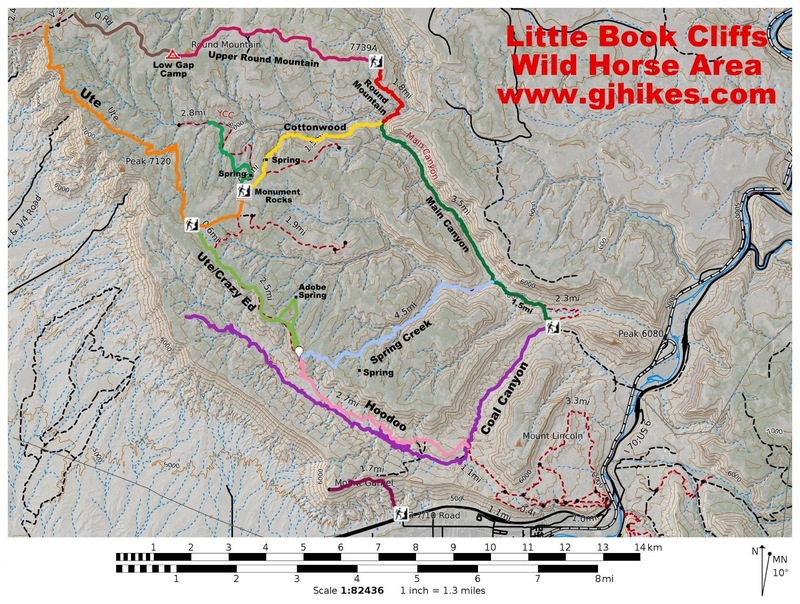 In the book 'Riding Old Trails' by James Curtis he mentions the brothers Dave and Charlie Knight that made a business of hunting wild horses in the Bookcliff Mountains. On one hunt they caught 72 head. A forest of dead standing juniper trees covers much of the nearby slopes. The area was burnt by the Pine Ridge fire several years back. Grass, wildflowers and snake weed are filling the void in a few places. The trail comes to an end at a Texaco gas well where it forms a loop for an easy turnaround point. Pine Ridge can be seen across the valley in the background. The row of trees in the middle of the photo, that give the ridge its name, make for a notable landmark when exploring other trails in the area. The Upper Round Mountain trail is an important link when backpacking or horseback riding the Round Mountain, Cottonwood Canyon and YCC loop. It is also a nice out-and-back option for hiking, mountain biking and ATVing/OHVing. There seems to be some sort of pecking order at Low Gap Camp where several of the trailers appear to be setup permanently but there are several open sites that we are guessing are open to anyone on a first come basis. There isn't a fee station at present so all indications is that camping is free. The drive to Low Gap Camp from DeBeque is about 25 miles of dirt and gravel road. The scenery varies along the way and some of it is quite incredible. This picture is of an area near a spot that locals used to call Goblin Park until some of the kids came along and toppled over all of the hoodoos. It is sad that such a beautiful place was vandalized but as you can see the area still has some merit. It at least helps make the long drive a bit more enjoyable. If you would like to see it for yourself then all you have to do is 'Take a hike'.